The stage 1.5 and GTP38R turbo package deal is good for up to 400hp. Ideal for towing and a good street performance package.The Stage 1.5 injectors are very popular for towing and everyday driving with a little more power than the stage 1 and still keep low smoke levels. The stage 1.5 achieves more power with the larger nozzle but they are still a great choice for towing and without stress on the stock drivetrain. The power made is very noticeable in all driving conditions from off idle to full throttle. The Full Force 7.3 Stage 1.5 injectors features new 30% larger nozzle and plunger barrel assemblies for long life and predictable performance. Garrett came out with a ball bearing charger that changed the 7.3 Powerstroke performance industry. The GTP38R is a direct fit drop in turbo with lightning fast spool up and a larger more efficient 66mm compressor wheel. 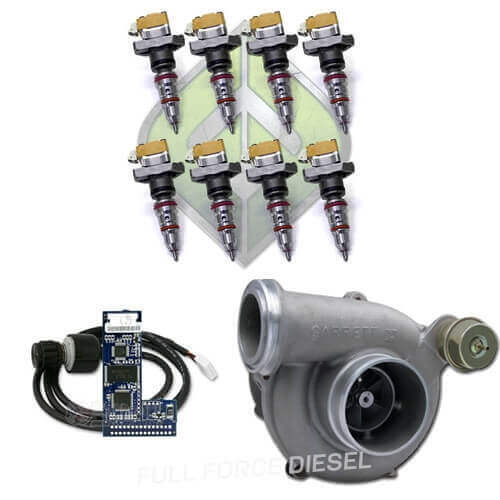 With this turbo kit, you will experience Garrett GT dual ball bearing technology working to give you unbelievable power pushing you back in the seat every time you push the throttle. The GTP38R Turbo has the Garrett exclusive ball bearing cartridge for unbeatable response, efficiency, and durability for your 7.3 Powrestroke. Elimination of the thrust bearing of a stock turbo eliminates failures at elevated boost levels with this design. Stock turbos are limited by 32-34psi while the Powermax can sustain a monstrous 40psi. The 88mm GT compressor wheel provides 33% more flow than the stock 80mm wheel. The ported shroud housing improves the compressor flow range for superior surge control. The 1.00 A/R turbine housing gives a reduction in back pressure and as much as 200 degree drop in EGT's. Maximum recommended boost level is 40psi on the Powermax. *A chip is required to run the single shot injectors in this package . Just swapped everything over. Let me tell you. Extremely noticeable. Topped it off with a cold air intake and 5inch turbo back exhaust from full force. Shes rolling like no other. These work a lot better than the original split shot injectors. Very happy. Customer service was awesome. Shipped my injectors out on a monday and recieved them the following monday. Everything was very well packaged and also included easy to follow instructions. Only issue I had was I went from a e99 to late 99 setup and the turbo did not come with the clamp or o ring that connects the turbo to the spider and I wasnt able to reuse the old ones because they were too small. I should of asked if they were included when I placed my order. I look forward to doing buisness with them again and would reccomend them to anyone. Q: Do you need to upgrade the fuel system? A: No these injectors can run on the stock fuel system. The only thing that you could get to benefit you is the FRX kit (but not required). A: This product is a GTP38R turbo and Stage 1.5 injectors. The chip is an optional purchase from the drop down menu. It's optional to purchase but required to run the injectors. The reason we don't include it with the package is because some customers already have a chip they can use. Q: What about stock hpop? A: Your stock HPOP can run this set up if it's still holding factory like pressure. Best way to know is to test your ICP pressure. 2725 points will be rewarded to you when you buy this item.